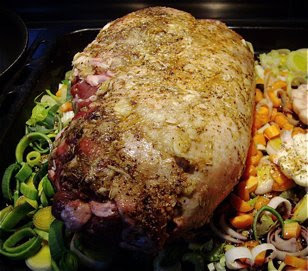 I prepared a Greek style, stuffed leg of lamb this Easter. Preparing it took time, but when left in the oven I could relax, and the end result was succulent and aromatic. 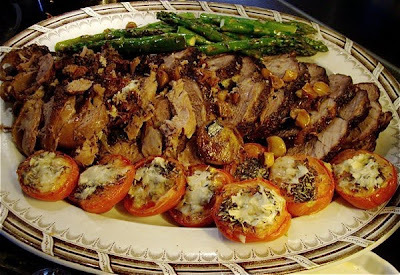 This is how I prepared a whole leg of lamb, and if you endure this process, I promise you an extremely delicious dish. 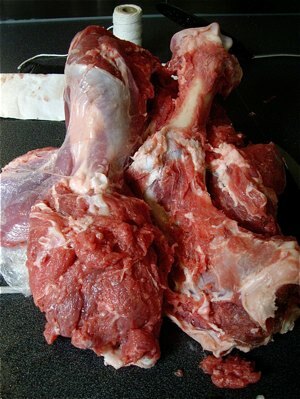 To remove the bone from a leg of lamb is serious surgery. You need at least three different utensils, one very sharp knife, one meat cleaver and one pair of strong scissors. 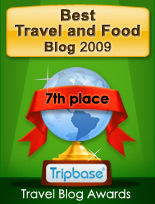 I had bought a chunk of meat weighing 3 kilos (roughly 7 lb's). I started to cut it the thickest end, where the bone was visible and followed the bones, folding the meat as I cut along the bone. This is seriously hard work. It is important preserve the outer surface of the leg as unscathed as possible, in order to reduce the sewing (yes, you got it right), effort needed. I used my nephew's Japanese ceramic knife, sharp as a razor blade. Along the joints I used either the meat cleaver to chop or scissor to cut over the smaller joints. 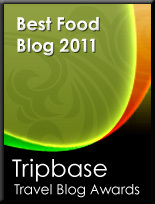 The goal is to ends up with one flat piece of meat, with no bones of joints left to ruin your experience. In these roughly cut leg roasts, you will always end up with parts of barely skin left and thicker lumps of meat. Try to get the inside of the leg as smooth as possible. 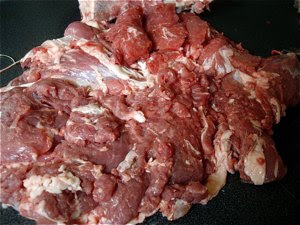 Make small incisions into the meat and use a mallet to flatten the meat into a roulade. This in order to make room for the filling. Check the outside. Use thin rope to mend openings on the surface. This to avoid the filling to leak out. Then I got to the Greek part of the preparation. I diced 300 grams / 11 oz of feta cheese. 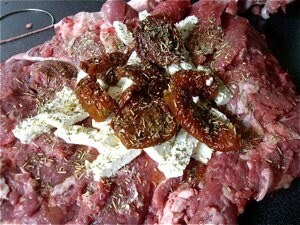 I placed the feta cheese on the meat, then placed a generous portion of marinated, sun dried tomatoes on top of the cheese, and added more bite by 10 cloves of garlic and dried Mediterranean herbs (thyme, rosemary, and oregano) to get that authentic Greek taste. Then came the surgery. I used a thick, crescent shaped needle and natural thin rope. I rolled the meat to enclose the filling and sewed the meat in order to make a roulade. You may also use rope to bind it into a roast. Moisten the surface with a little olive oil. Season the roulade with salt, pepper, garlic and dried herbs. Roll in cling film and allow to marinate over night. Take out the lamb early next morning. Cut one large leek, 3 large carrots and 3 celery stalks and place in a large frying pan. Cut two whole bulbs of garlic in half and place the halves with the vegetables. Season with a little salt and pepper. Drizzle with olive oil and mix well. Pour 50 cl ( 1 pint) of unsalted stock (cut the salt in the seasoning if you use a stock cube), and one large glass of good red wine. Place lamb on top of the vegetables and put it in a low oven 100C / 210F for 10 hours. Remove the vegetables after five hours and press the juices through a colander in order to extract as much liquid as possible as a base for your sauce. Allow meat to rest 20 minutes packed in tin foil, then carve into 1-2 cm / 1 inch slices.